Arrowpoint is a supplementary decorative technique which is used in the decoration of manuscripts and which takes place at the conclusion of the design being made. The meaning of the term "arrowpoint" as it is used in illumination work is not to be found in the dictionary. Nevertheless, on page 1986 of Volume IV of Celal Esad Arvesen's Sanat Ansiklopedisi, we find the following explanation: Sharp-pointed sections extending outward like arrows in the decorations employed in bookbinding and illumination work. These sections are generally done in paint or in gold. The name given to this style of decoration in Turkish, tig most likely came into the language from the Farsi word which means "sword." Indeed the arrowpoint or tig motifs employed in illumination are sharp, thin, and long, just like swords. The term illumination is given to all manner of decoration made with paint or gilding in manuscripts and collages. In addition to gold, root dyes, colored earth paints, metallic oxides, and the powders of various colored stones mixed with water and gum were all used. In hand-written manuscripts, the external cover called zahriye, the epilogue known as hatime, the title (serlevha), the headings in the Quran (Sura headings, Chapter headings), the rosettes indicating the places in the text where prostration should be performed, the section "roses," the beginnings and ends of the verses (stops), and in some works, all edges outside the text itself were illuminated. The illuminator would prepare his mold, and fastening it vertically onto a hard surface, place the page to be illuminated on it. Charcoal dust was sprinkled over the page and the process of silkme or pouncing the mold would be completed. If the whole page was to be illuminated, only a quarter of the design would be pounced so as to prevent one's hand from spoiling the painted sections; as the painting progressed one advanced to the other parts. First the contours would be drawn then the colors would be drawn then the colors would be filled in with gilt or earthen paints. Then the gilded sections would be burnished and polished. Needle points would be added so as best to enhance the motif. Styles in illumination varied according to the age, city and locality in which they were employed. Nevertheless with the exception of a few rare examples, the transition between decoration and blank area was always effected by means of arrowpoint. "Arrowpoint, generally accepted as a supplementary element in the Turkish decorative arts, in fact occupies an important place in illumination. Starting off from where the illumination begins, the decorations extend outward like arrows in parallel lines, and terminate in sharp points. It is clear that they were made for the purpose of achieving a balance between the decorated portions and the remainder. In the decoration of manuscripts, the amount of area left blank had as great an influence on beauty as that which was written or illuminated. Arrowpoint however achieved a balance between these two portions, and eased the transition of the eye to the empty space. Nevertheless, it is very important that arrowpoint be carried out at pacific proportions depending on the place it is used and that it achieve harmony with the illumination. In works beautifully and exquisitely decorated with illumination, the balance and amount of the arrokwpoint and its variety despite its simplicity is a source of amazement. While there are hundreds of varieties of arrowpoint, and they vary over the centuries, in all cases the motif is a transition from broad to narrow, and they terminate in points. In most arrowpoint decorations, lines, points, and small convolutions are exploited. At times, sun-burst and geometric designs, cloud and flower motifs, and animalise forms are to be observed. Mameluke Illumination was done in gold, blue and yellowish-grey. Arrowpoints were blue and drawn sparsely, and they are in the form of a rather long straight line with a single horizontal line, or else with a single convolution extending to either side. Seljuk Illumination was done in gold, dark blue, white, and reddish brown. 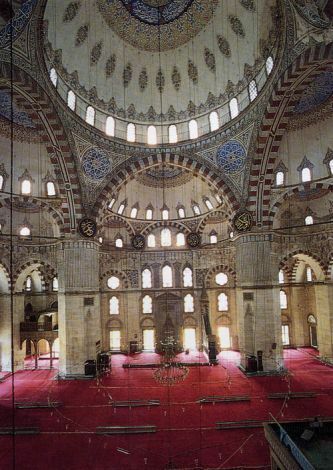 Transitions were by means of geometric motifs and Seljuk arches. In headings and full-page illuminations, there is either no arrowpoint at all or else it is in the form of small extensions and sparsely drawn lines. In the medallion on the other hand, at the point of juncture of the Seljuk arches one sees occasional blue arrowpoint consisting of plan lines and small circles. Here, delicate blue arrowpoint complements the zerenderzer (literally, "gold-on-gold") decoration. In heading arrowpoint, devotailing motifs, are also to be encountered, while in medallion arrowpoint there are small projections and plain, stylized motifs passing from thick to thin, which are nevertheless of great beauty. A great number of books illuminated in the Palace workshops during the period of the Conquest are today in the Fatih Collection of the Süleymaniye Library, included among other works in the collection which belonged to members of the Palace. As will be seen in these works, the art of illumination during the period of the Conquest was quite advanced. The lovely style of decoration, which without becoming excessive, managed to complement the text and make it stand out is also reflected in the arrowpoint. It is during this period that we see the most beautiful examples of arrowpoint drawn in blue and gold, in dovetailed and geometric forms. Flower motifs consisting of tiny triangles between two small curves extending from a single point, two short horizontal lines parallel to one another, thickened points, and small filled-in triangles are so masterfully interwove that it is almost as if no two arrowpoints are the same. Sehabeddin Ahmed Sivasi, Uyunü't -tefasir , 886 A.H.-1481 A.D. Arrowpoint consisting of small lines and convolutions in an oval medallion. When we examine a great number of hand-written manuscripts, we observe that the predominant color in arrowpoint is blue. Nevertheless, depending on the work and the illumination, gold, red, and green were also added to this primary color. Classical illumination experienced its second bright period in the 16th Century. The wealth of motifs, colors, and composition, perfection of technique, the variety observed in design and the exquisite taste, and the profuse but color-harmonious use of gold are all the primary features of this period's illumination. Arrowpoint of course developed in parallel with this, and achieved its most mature and beautiful forms. The lines have been enriched, and with the addition of sun-burst designs, delicate motifs appeared. The proliferation of arrowpoint designs increased considerably, and to them were added space-filling motifs in the interstices. In the second half of the 16th Century, realistic flower motifs -through not very common- were included among the arrowpoint. During this century, arrowpoint was done in blue and gold, with an occasional addition of red as well. In the 17th Century, we see that gold was used even more lavishly in illumination. In the decoration of the arrowpoint we find realistic flower motifs, animallike figures, and needle point decorations on a field of glitter. In the 18th Century, illumination was done in two styles. On the one hand there were decorations made with large flowers, and huge, complex motifs, indications that illumination had begun to change, and room was left for arrowpoint in the large and colorful flowers. On the other however, the styles of the Baroque and Rococo entered illumination and among the ribbons, vases, multi-colored flowers and ornamentation approaching the excessive, there was no room left for arrowpoint. Arrowpoint also shows particular features according to its location and form. Arrowpoint complementing the circular or oval medallion on the cover disperses itself into the void like bundles of light radiating from a center. In mihrab work or in book titles, it rises like parallel arrows. Sometimes a single arrowpoint is observed, sometimes we see them in rows. Quran, Sun-burst motifs are apparent in the title instead of arrowpoint. Larger motifs were employed on the lower part, while thinner and smaller motifs were used on the top. Just as arrowpoints in Sura and Prostration rosettes are drawn on pain grounds, there are those done by means of needle point of fields of glitter, and those with flowers. The arrowpoint motifs in Sure and Prostration rosettes are done with their upper portions long while the lower parts are left short. When there are several such rosettes on the same page, they are most often joined together by means of arrowpoint. Arrowpoint made up of the alternation of arrowpoints having thesame motif, or sometimes two distinct motifs, and sometimes with the interstices filled in with minor figures, increases and punctuates the beauty of the illumination.